Model Name: RM016 "The Hour Glass"
Specially made for the retailer The Hour Glass, this iteration of the RM016 was introduced at the Singapore Tempus Watch Fair in 2007. It was part of an All-Black Commemorative Collection. The present watch is numbered 12 of a limited edition of 28 pieces. Displaying a particularly thin rectangular case and skeletonized dial, the RM016 is a design departure from Richard Mille’s usual tonneau-shaped case. Presented in excellent and barely-worn condition, this timepiece is replete with the original warranty and winding box. An incredibly versatile model, the RM016 is experiencing a renaissance, having been reimagined in the newest Bonbon Collection during the Salon International de la Haute Horlogerie in Geneva in 2019. In its latest reincarnation, the model is adorned with sweets and fruits made with grand feu enamel. Novel and awe-inducing, its launch sent reverberations throughout the watch community. 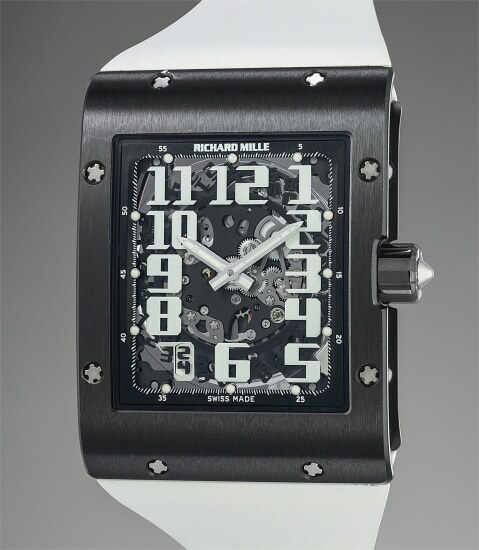 This is an opportunity to acquire the model in a stealth form, while referencing the roots and DNA of Richard Mille. Established in 1999, Richard Mille's ultra-modern timepieces combine cutting-edge materials from high performance worlds such as Formula 1 racecars with high-end traditional watchmaking. The brand's revolutionary designs, technical breakthroughs and exceptional hand-finishing excite even the most discriminating collectors, and have positioned Richard Mille alongside the top makers of the modern luxury watch world. Innovative watches, such as the RM 027 Tourbillon, which was the world’s lightest mechanical watch when introduced in 2011, have helped the brand invert the concept of the luxury watch. Key models include the RM 009 Tourbillon cased in Aluminum Silicon Carbide (AlSiC), the RM 027-02 Tourbillon made for tennis star Rafael Nadal with a case made from quartz and carbon fiber and the RM 008 split seconds chronograph.